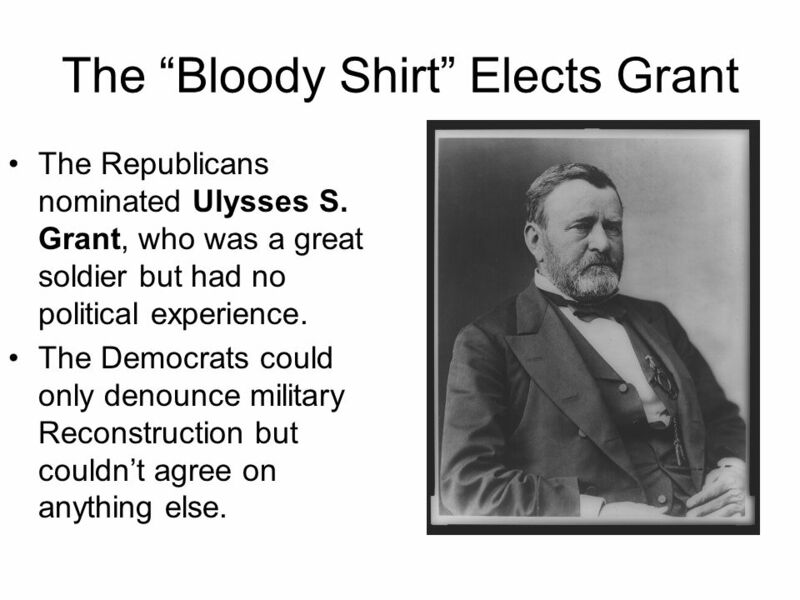 The Republicans nominated Ulysses S. Grant, who was a great soldier but had no political experience. The Democrats could only denounce military Reconstruction but couldn’t agree on anything else. Despite the Civil War, population still mushroomed, due to incoming immigration, but during this time, politics became very corrupted. Railroad promoters cheated gullible customers. Stock-market investors were a cinder in the public eye. Too many judges and legislators put their power up for hire. 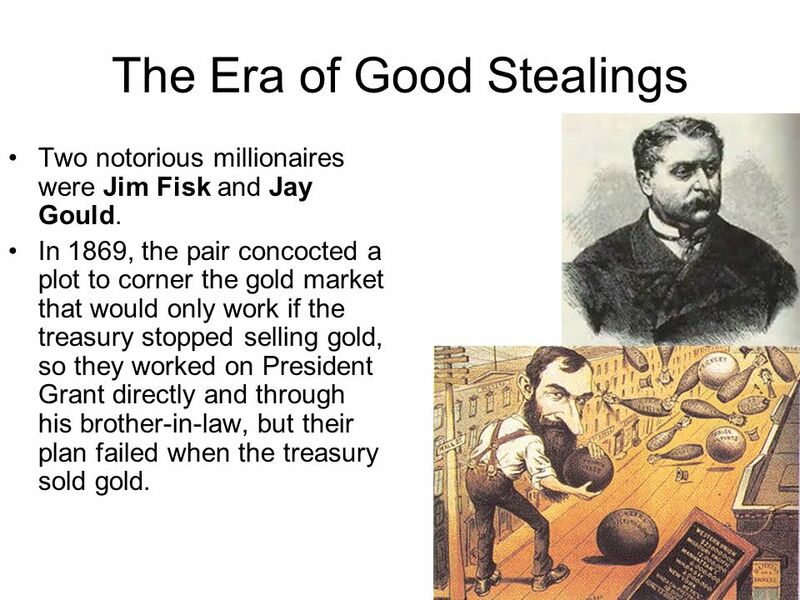 Two notorious millionaires were Jim Fisk and Jay Gould. In 1869, the pair concocted a plot to corner the gold market that would only work if the treasury stopped selling gold, so they worked on President Grant directly and through his brother-in-law, but their plan failed when the treasury sold gold. 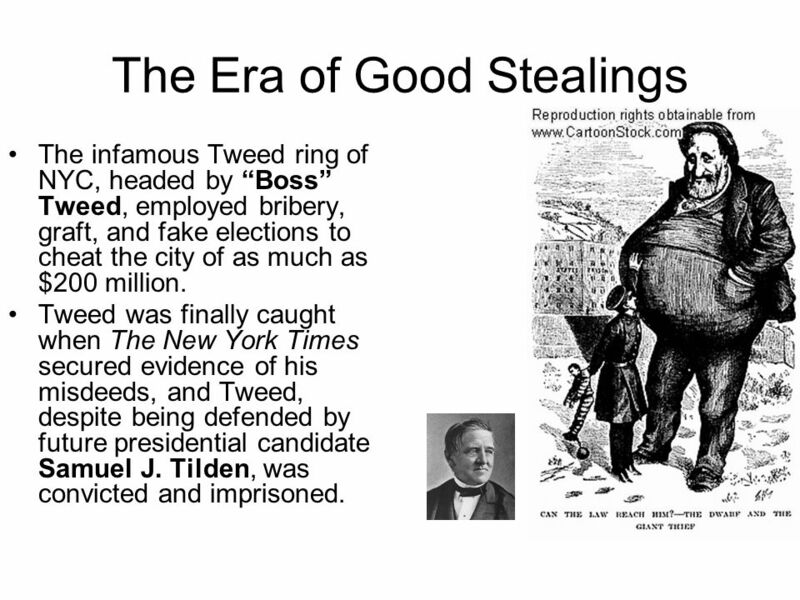 The infamous Tweed ring of NYC, headed by “Boss” Tweed, employed bribery, graft, and fake elections to cheat the city of as much as $200 million. Tweed was finally caught when The New York Times secured evidence of his misdeeds, and Tweed, despite being defended by future presidential candidate Samuel J. Tilden, was convicted and imprisoned. 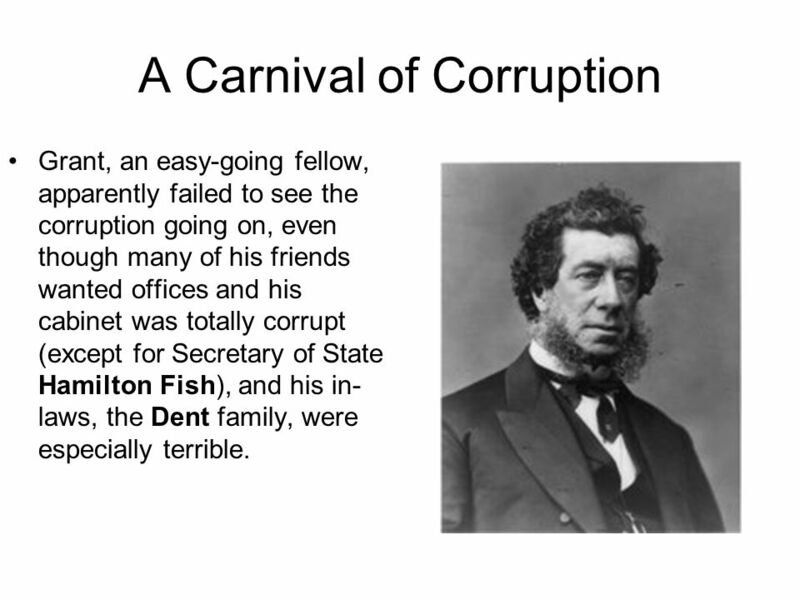 Grant, an easy-going fellow, apparently failed to see the corruption going on, even though many of his friends wanted offices and his cabinet was totally corrupt (except for Secretary of State Hamilton Fish), and his in-laws, the Dent family, were especially terrible. 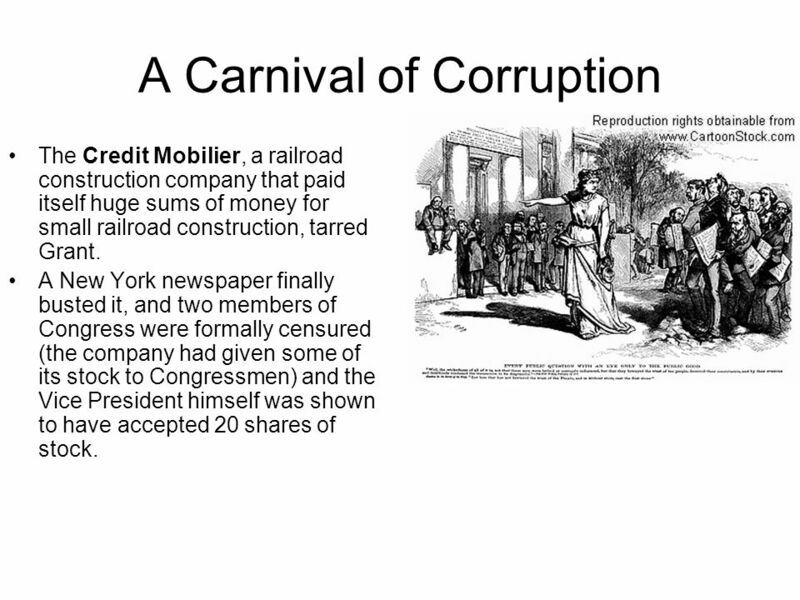 The Credit Mobilier, a railroad construction company that paid itself huge sums of money for small railroad construction, tarred Grant. A New York newspaper finally busted it, and two members of Congress were formally censured (the company had given some of its stock to Congressmen) and the Vice President himself was shown to have accepted 20 shares of stock. 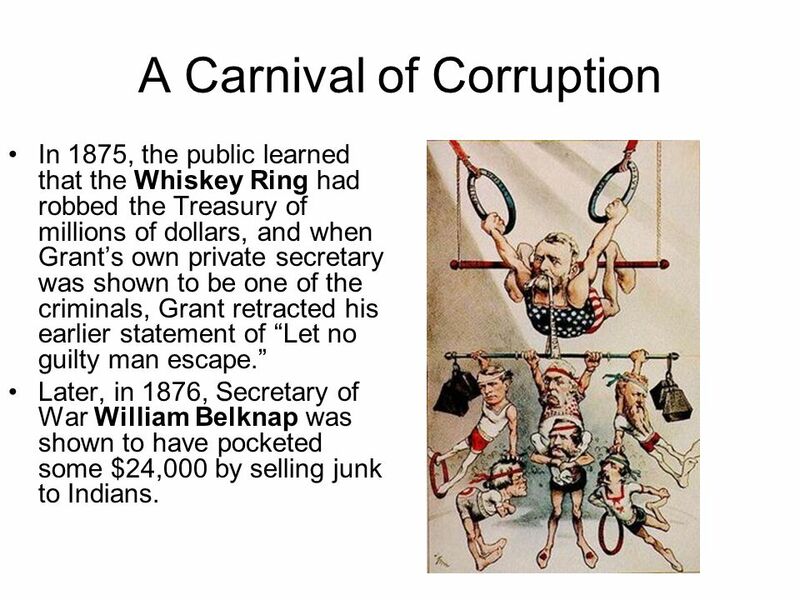 In 1875, the public learned that the Whiskey Ring had robbed the Treasury of millions of dollars, and when Grant’s own private secretary was shown to be one of the criminals, Grant retracted his earlier statement of “Let no guilty man escape.” Later, in 1876, Secretary of War William Belknap was shown to have pocketed some $24,000 by selling junk to Indians. 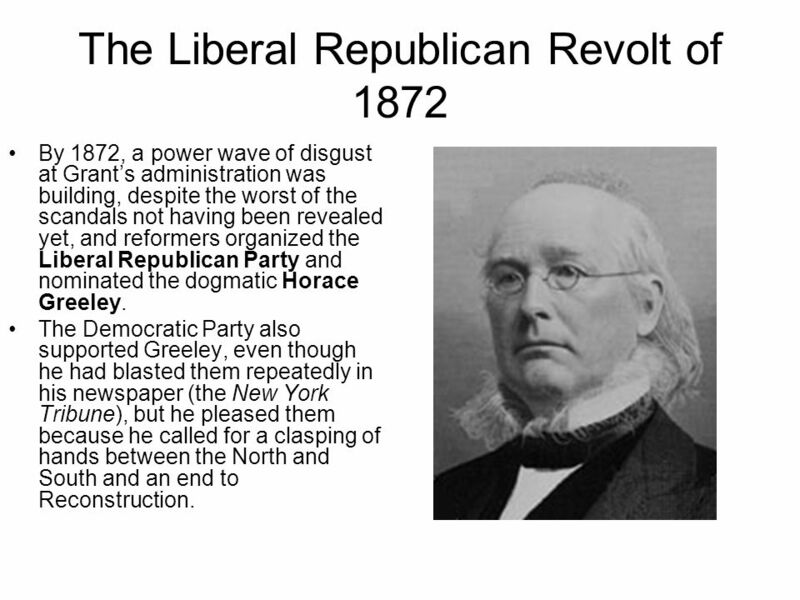 By 1872, a power wave of disgust at Grant’s administration was building, despite the worst of the scandals not having been revealed yet, and reformers organized the Liberal Republican Party and nominated the dogmatic Horace Greeley. The Democratic Party also supported Greeley, even though he had blasted them repeatedly in his newspaper (the New York Tribune), but he pleased them because he called for a clasping of hands between the North and South and an end to Reconstruction. 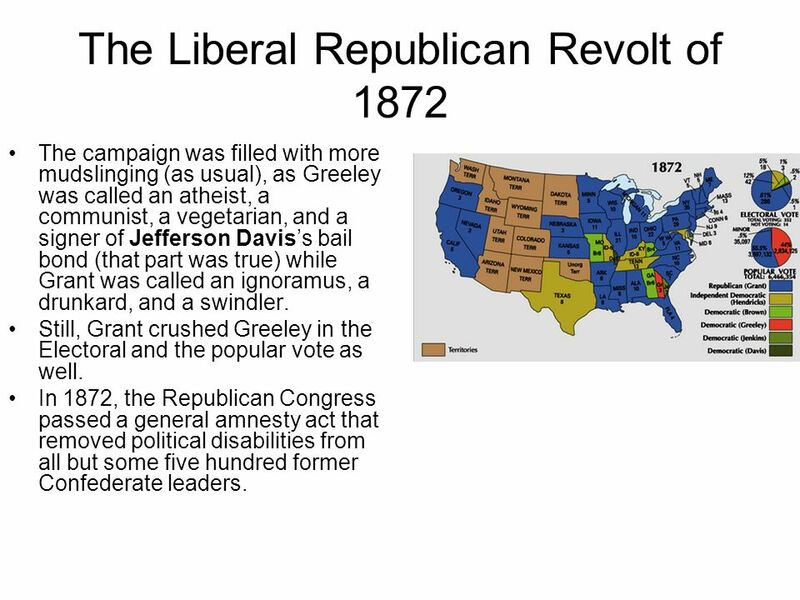 The campaign was filled with more mudslinging (as usual), as Greeley was called an atheist, a communist, a vegetarian, and a signer of Jefferson Davis’s bail bond (that part was true) while Grant was called an ignoramus, a drunkard, and a swindler. Still, Grant crushed Greeley in the Electoral and the popular vote as well. In 1872, the Republican Congress passed a general amnesty act that removed political disabilities from all but some five hundred former Confederate leaders. 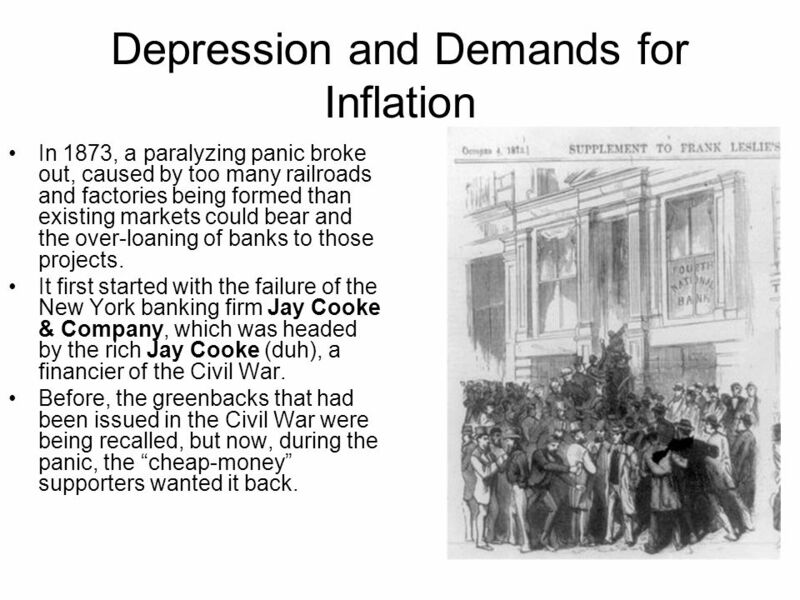 In 1873, a paralyzing panic broke out, caused by too many railroads and factories being formed than existing markets could bear and the over-loaning of banks to those projects. It first started with the failure of the New York banking firm Jay Cooke & Company, which was headed by the rich Jay Cooke (duh), a financier of the Civil War. Before, the greenbacks that had been issued in the Civil War were being recalled, but now, during the panic, the “cheap-money” supporters wanted it back. However, supporters of hard-money (actually gold and silver) persuaded Grant to veto a bill that would print more paper money, and the Resumption Act of 1875 pledged the government to further withdraw greenbacks and made all further redemption of paper money in gold at face value, starting in 1879. 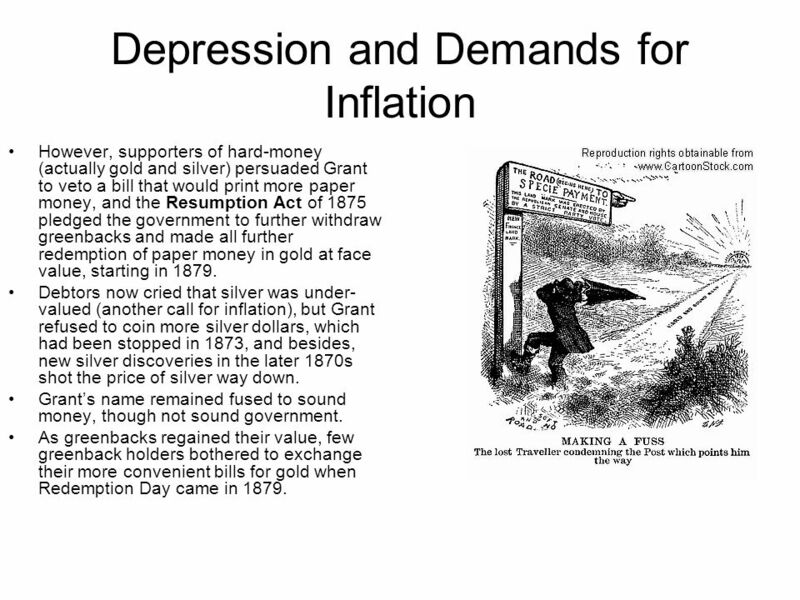 Debtors now cried that silver was under-valued (another call for inflation), but Grant refused to coin more silver dollars, which had been stopped in 1873, and besides, new silver discoveries in the later 1870s shot the price of silver way down. Grant’s name remained fused to sound money, though not sound government. As greenbacks regained their value, few greenback holders bothered to exchange their more convenient bills for gold when Redemption Day came in 1879. In 1878, the Bland-Allison Act instructed the Treasury to buy and coin between $2 million and $4 million worth of silver bullion each month. 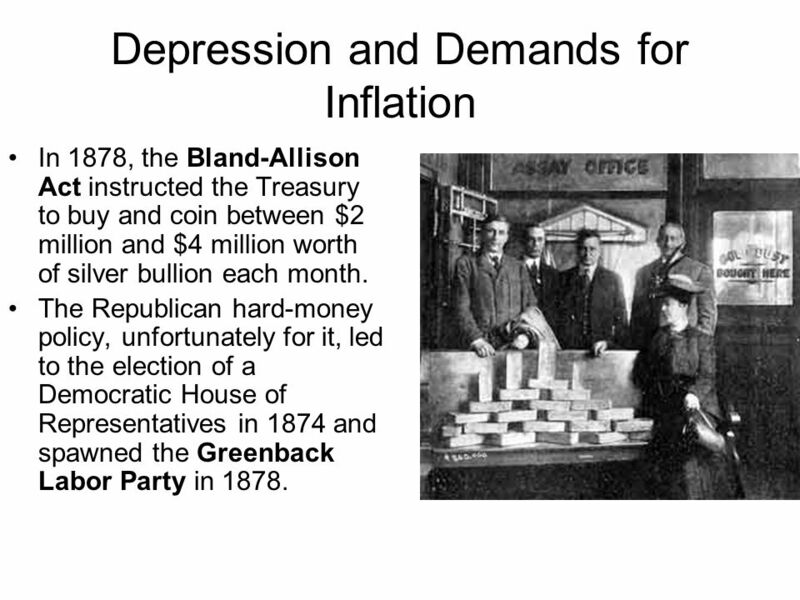 The Republican hard-money policy, unfortunately for it, led to the election of a Democratic House of Representatives in 1874 and spawned the Greenback Labor Party in 1878. 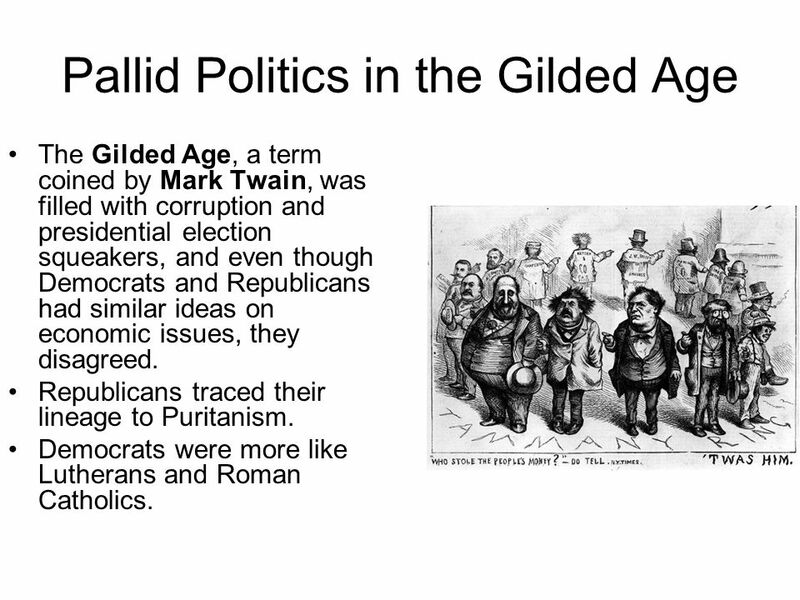 The Gilded Age, a term coined by Mark Twain, was filled with corruption and presidential election squeakers, and even though Democrats and Republicans had similar ideas on economic issues, they disagreed. Republicans traced their lineage to Puritanism. Democrats were more like Lutherans and Roman Catholics. Democrats had strong support in the South. Republicans had strong votes in the North and the West, and from the Grand Army of the Republic, an organization made up of former Union veterans. 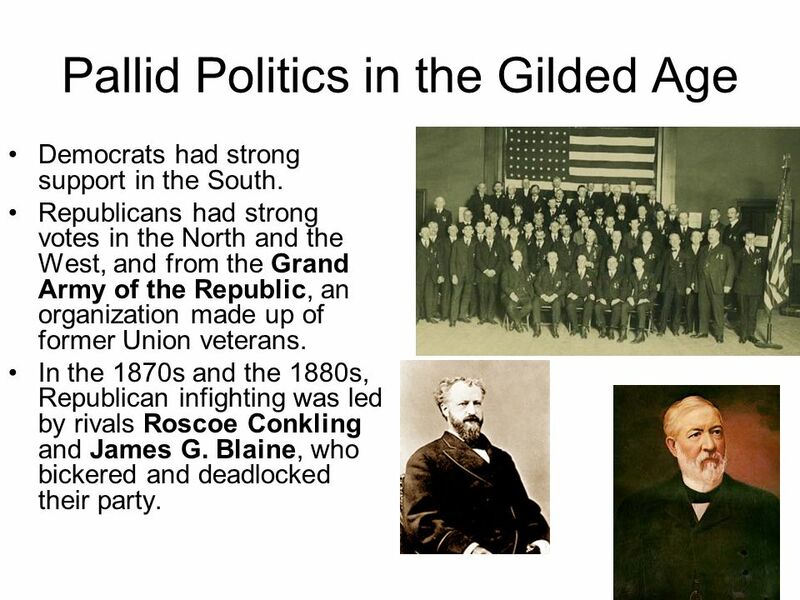 In the 1870s and the 1880s, Republican infighting was led by rivals Roscoe Conkling and James G. Blaine, who bickered and deadlocked their party. 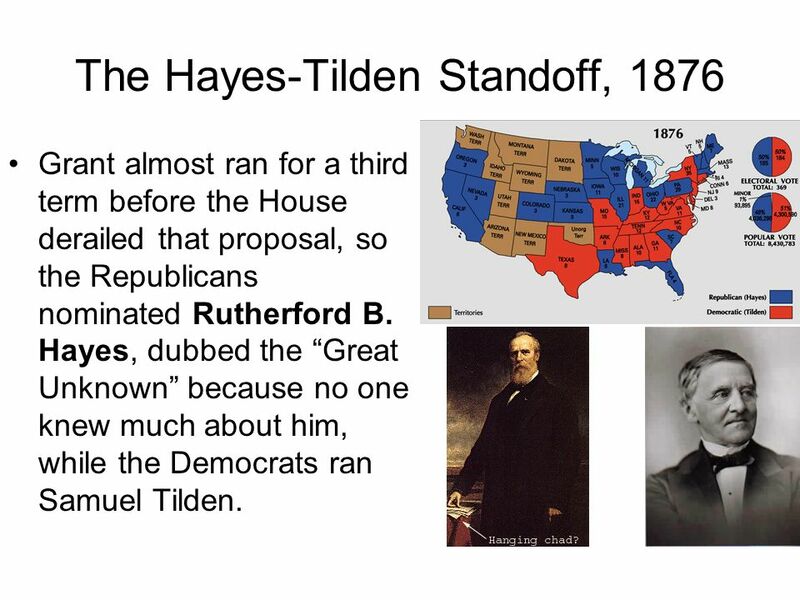 Grant almost ran for a third term before the House derailed that proposal, so the Republicans nominated Rutherford B. Hayes, dubbed the “Great Unknown” because no one knew much about him, while the Democrats ran Samuel Tilden. In February of 1877, the Senate and the House met to settle the dispute, and eventually, Hayes became president as a part of the Compromise of 1877: He could become president if he agreed to remove troops from the remaining two Southern states where Union troops remained (Louisiana and South Carolina), and also, a bill would subsidize the Texas and Pacific Rail-line. 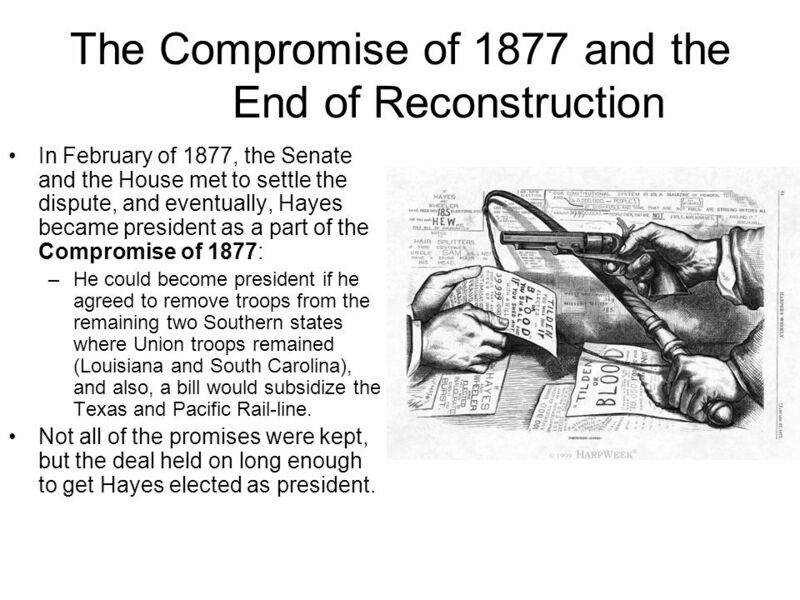 Not all of the promises were kept, but the deal held on long enough to get Hayes elected as president. The Compromise of 1877 abandoned the Blacks in the South by withdrawing troops, and their last attempt at protection of Black rights was the Civil Rights Act of 1875, which was mostly declared unconstitutional by the Supreme Court in the 1883 case Civil Rights Cases. As Reconstruction ended, Whites once again discriminated against Blacks, forcing them into low-wage labor and restricting their rights. In 1896, the Supreme Court ruled, in the case of Plessy vs. Ferguson, that “separate but equal” facilities were constitutional. In 1877, the presidents of the nation’s four largest railroads decided to cut wages by 10%, and workers struck back, stopping work, and when President Hayes sent troops to stop this, violence erupted, and more than 100 people died in the several weeks of chaos. 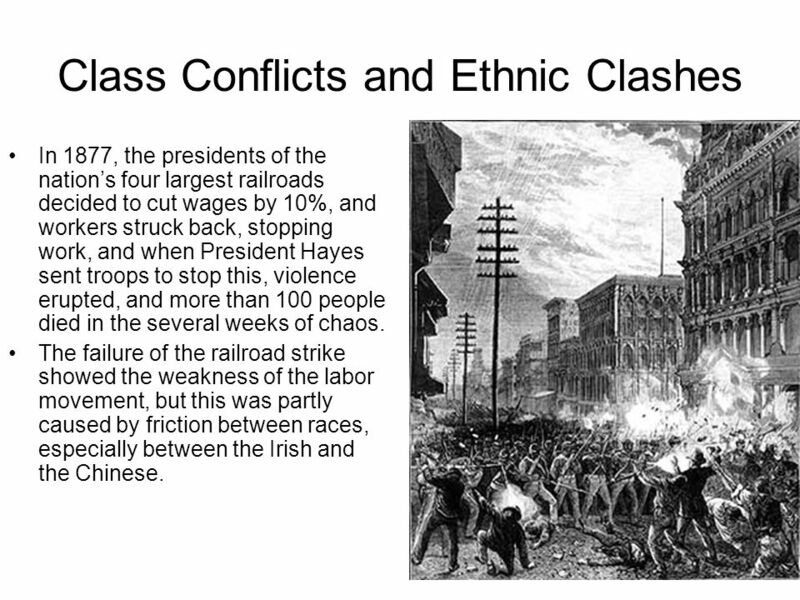 The failure of the railroad strike showed the weakness of the labor movement, but this was partly caused by friction between races, especially between the Irish and the Chinese. In San Francisco, Irish-born Denis Kearney incited his followers to terrorize the Chinese. In 1879, Congress passed a bill severely restricting the influx of Chinese immigrants (most of whom were males who had come to California to work on the railroads), but Hayes vetoed the bill on grounds that it violated an existing treaty with China. 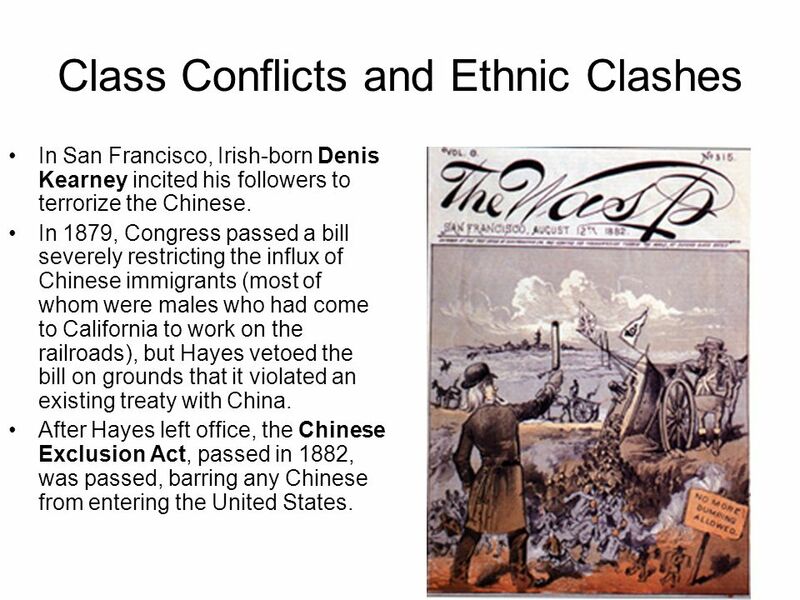 After Hayes left office, the Chinese Exclusion Act, passed in 1882, was passed, barring any Chinese from entering the United States. 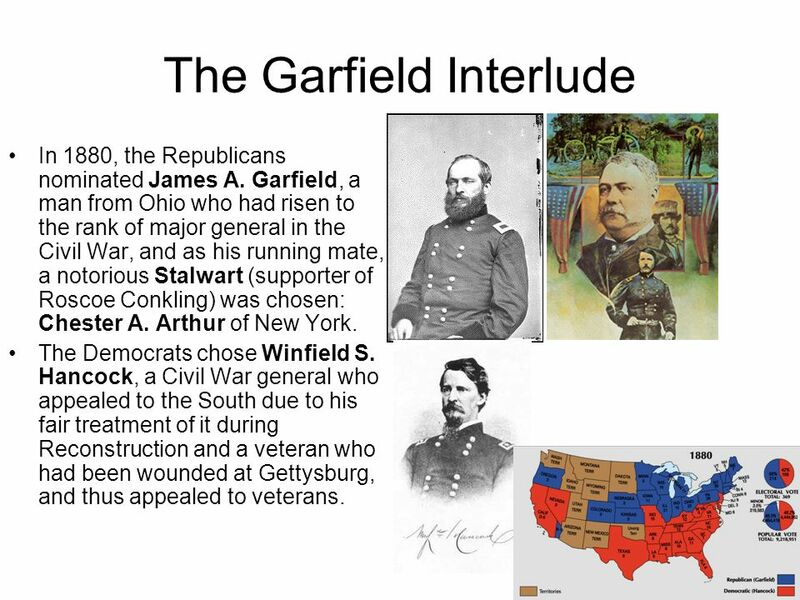 In 1880, the Republicans nominated James A. Garfield, a man from Ohio who had risen to the rank of major general in the Civil War, and as his running mate, a notorious Stalwart (supporter of Roscoe Conkling) was chosen: Chester A. Arthur of New York. The Democrats chose Winfield S. Hancock, a Civil War general who appealed to the South due to his fair treatment of it during Reconstruction and a veteran who had been wounded at Gettysburg, and thus appealed to veterans. 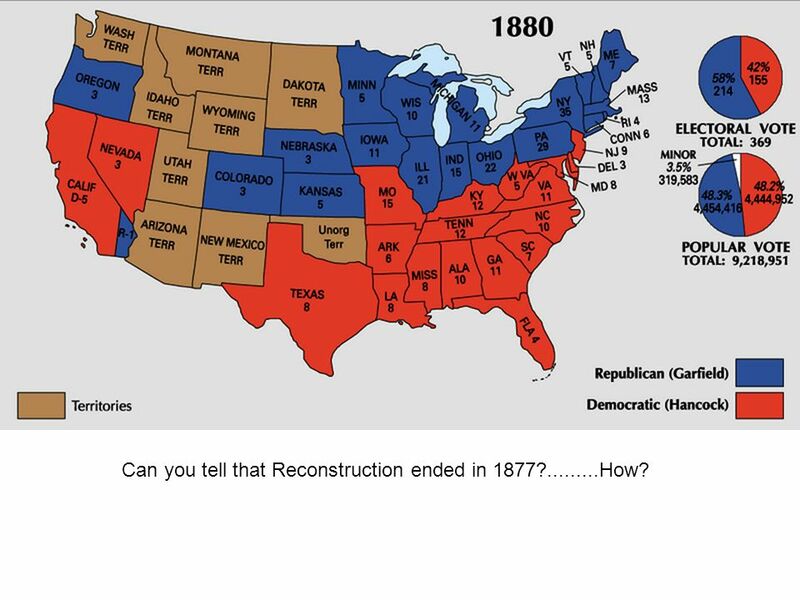 23 Can you tell that Reconstruction ended in 1877?.........How? 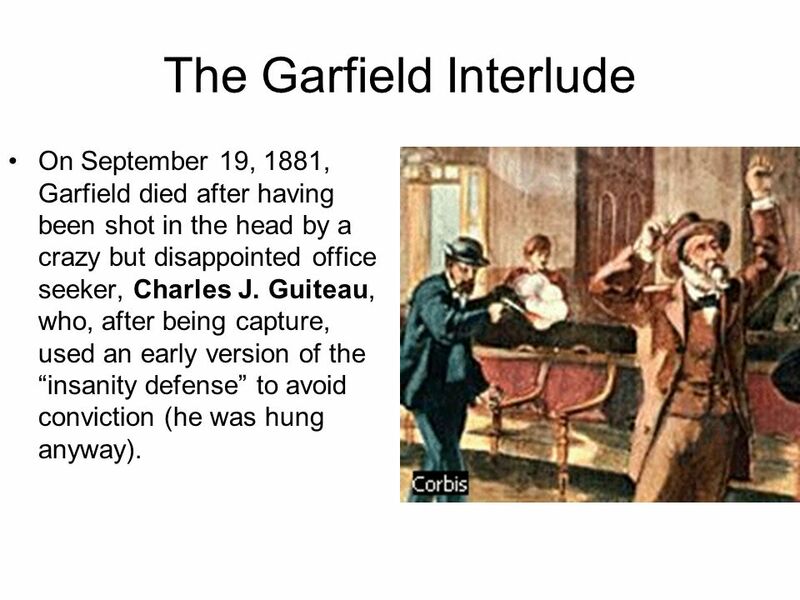 On September 19, 1881, Garfield died after having been shot in the head by a crazy but disappointed office seeker, Charles J. Guiteau, who, after being capture, used an early version of the “insanity defense” to avoid conviction (he was hung anyway). 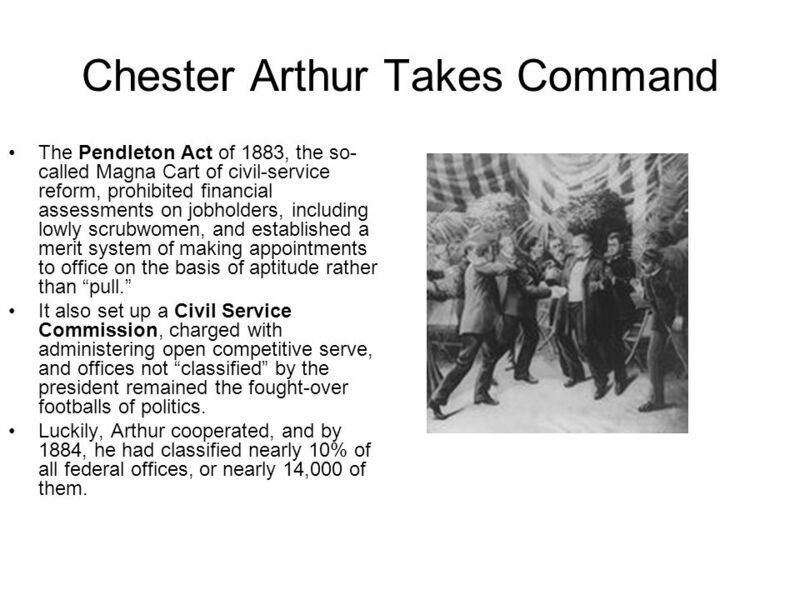 The Pendleton Act of 1883, the so-called Magna Cart of civil-service reform, prohibited financial assessments on jobholders, including lowly scrubwomen, and established a merit system of making appointments to office on the basis of aptitude rather than “pull.” It also set up a Civil Service Commission, charged with administering open competitive serve, and offices not “classified” by the president remained the fought-over footballs of politics. Luckily, Arthur cooperated, and by 1884, he had classified nearly 10% of all federal offices, or nearly 14,000 of them. 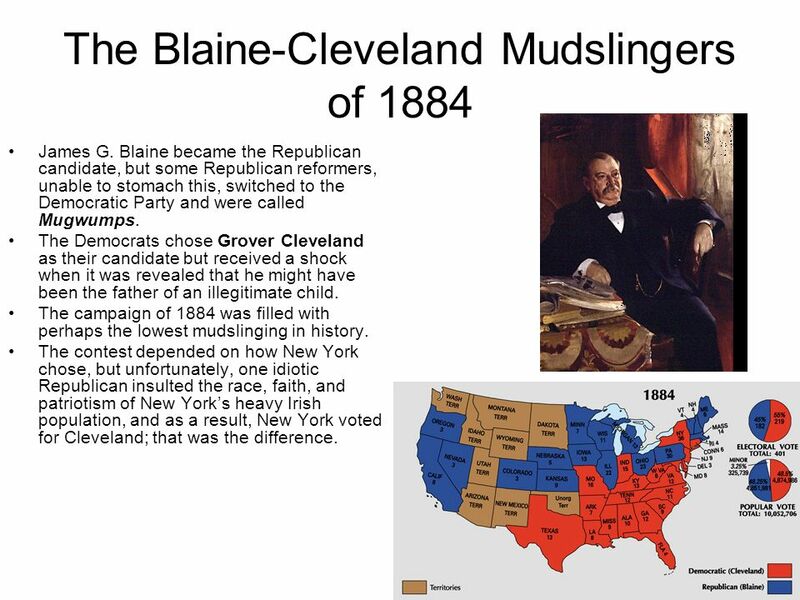 James G. Blaine became the Republican candidate, but some Republican reformers, unable to stomach this, switched to the Democratic Party and were called Mugwumps. The Democrats chose Grover Cleveland as their candidate but received a shock when it was revealed that he might have been the father of an illegitimate child. The campaign of 1884 was filled with perhaps the lowest mudslinging in history. The contest depended on how New York chose, but unfortunately, one idiotic Republican insulted the race, faith, and patriotism of New York’s heavy Irish population, and as a result, New York voted for Cleveland; that was the difference. 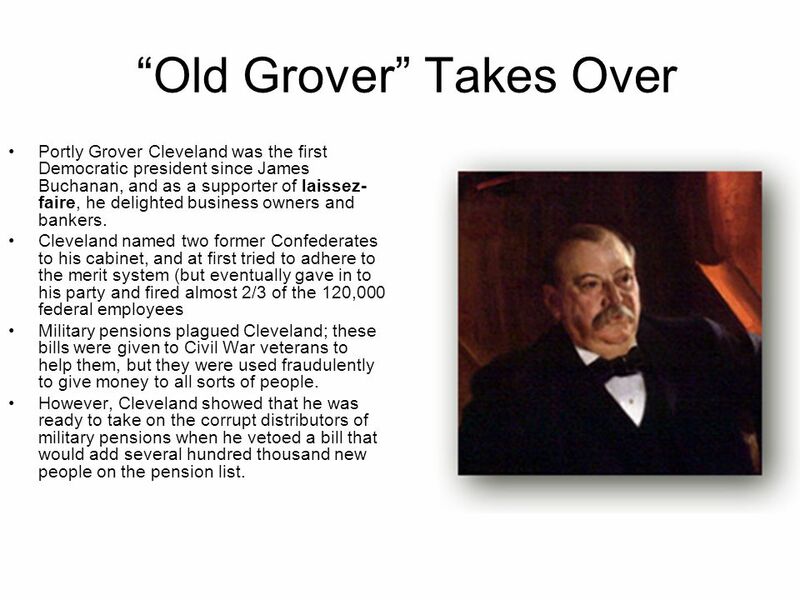 Portly Grover Cleveland was the first Democratic president since James Buchanan, and as a supporter of laissez-faire, he delighted business owners and bankers. Cleveland named two former Confederates to his cabinet, and at first tried to adhere to the merit system (but eventually gave in to his party and fired almost 2/3 of the 120,000 federal employees Military pensions plagued Cleveland; these bills were given to Civil War veterans to help them, but they were used fraudulently to give money to all sorts of people. However, Cleveland showed that he was ready to take on the corrupt distributors of military pensions when he vetoed a bill that would add several hundred thousand new people on the pension list. By 1881, the Treasury had a surplus of $145 million, most of it having come from the high tariff, and there was lots of clamor for lowering the tariff, though big industrialists opposed it. 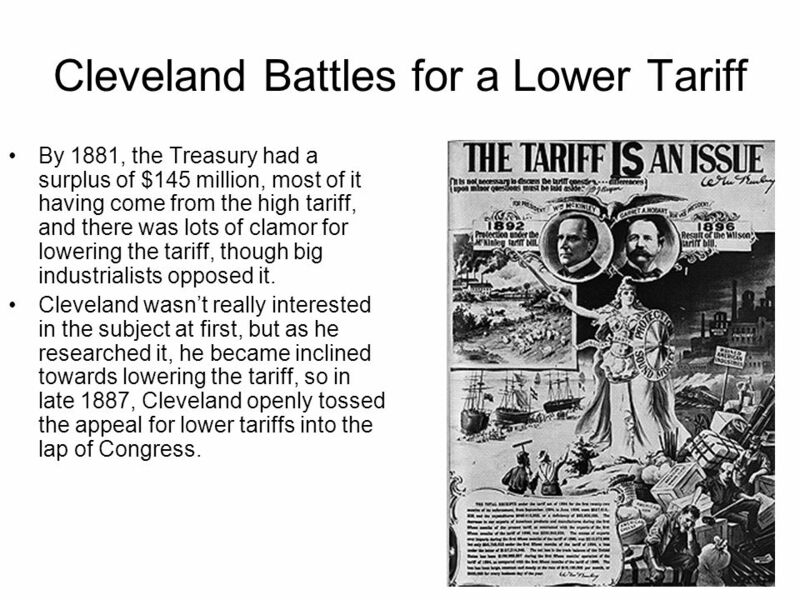 Cleveland wasn’t really interested in the subject at first, but as he researched it, he became inclined towards lowering the tariff, so in late 1887, Cleveland openly tossed the appeal for lower tariffs into the lap of Congress. 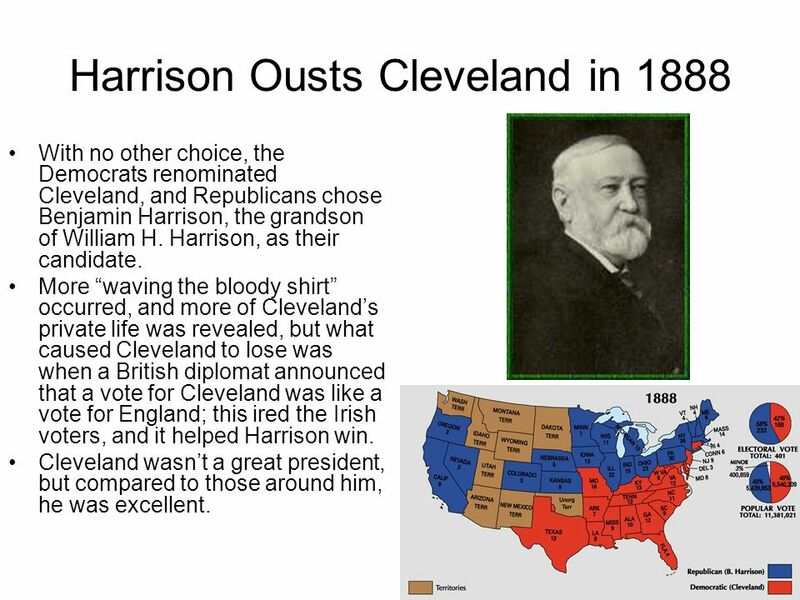 With no other choice, the Democrats renominated Cleveland, and Republicans chose Benjamin Harrison, the grandson of William H. Harrison, as their candidate. 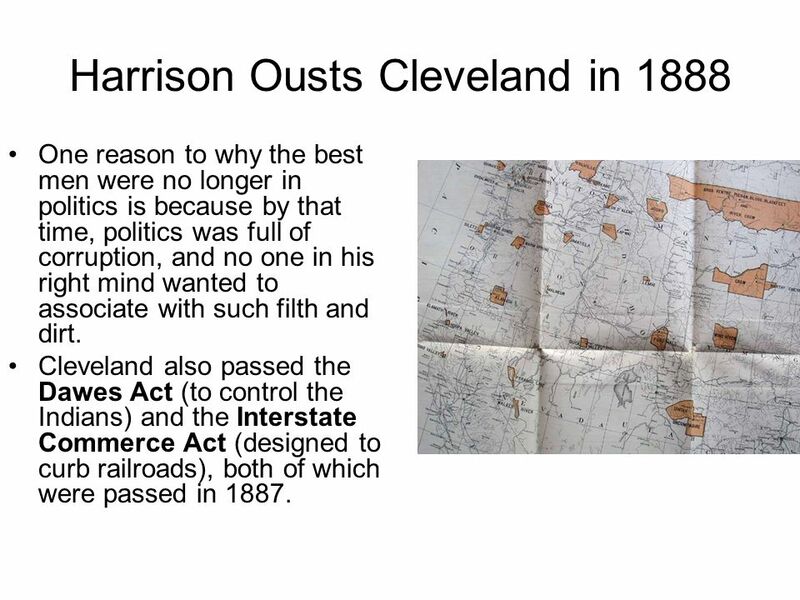 More “waving the bloody shirt” occurred, and more of Cleveland’s private life was revealed, but what caused Cleveland to lose was when a British diplomat announced that a vote for Cleveland was like a vote for England; this ired the Irish voters, and it helped Harrison win. Cleveland wasn’t a great president, but compared to those around him, he was excellent. One reason to why the best men were no longer in politics is because by that time, politics was full of corruption, and no one in his right mind wanted to associate with such filth and dirt. 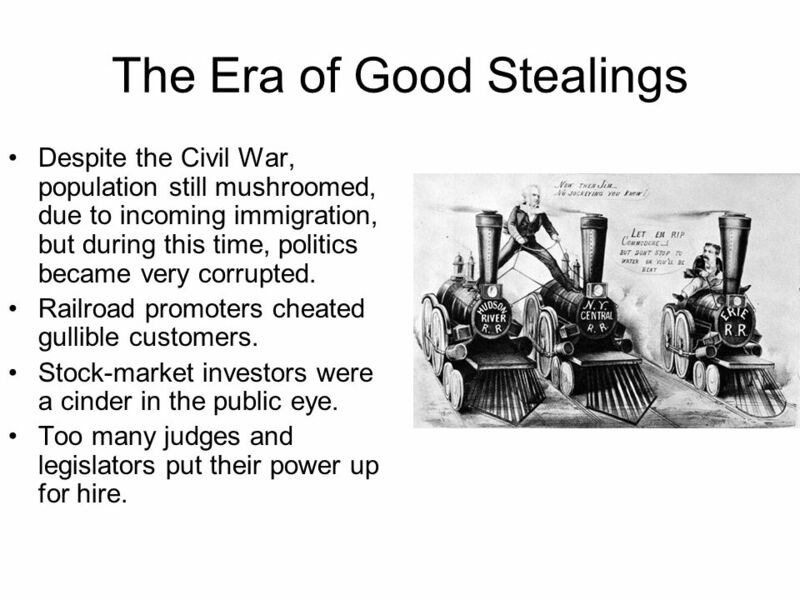 Cleveland also passed the Dawes Act (to control the Indians) and the Interstate Commerce Act (designed to curb railroads), both of which were passed in 1887. 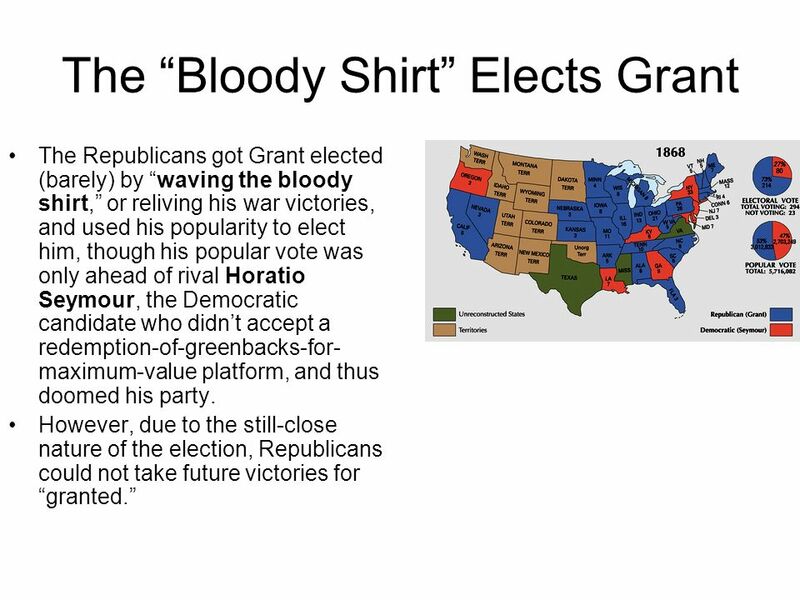 Download ppt "The “Bloody Shirt” Elects Grant"
Post – War Years Northern business booms Northern business booms Transcontinental railroad in 69 Transcontinental railroad in 69 Irish/German/British/Scandinavian. Political Paralysis in the Gilded Age ( ) Copyright © Houghton Mifflin Company. All rights reserved. Politics of the Gilded Age. Stalemate in Washington. Know the difference between a stalwart and a halfbreed. Discuss the doctrines of the Pendleton Act. Know what the republicans. Dr. Romeyn The Bullis School. The Gilded Age What led to the massive wealth and economic growth that characterized this time period? Who was left out. 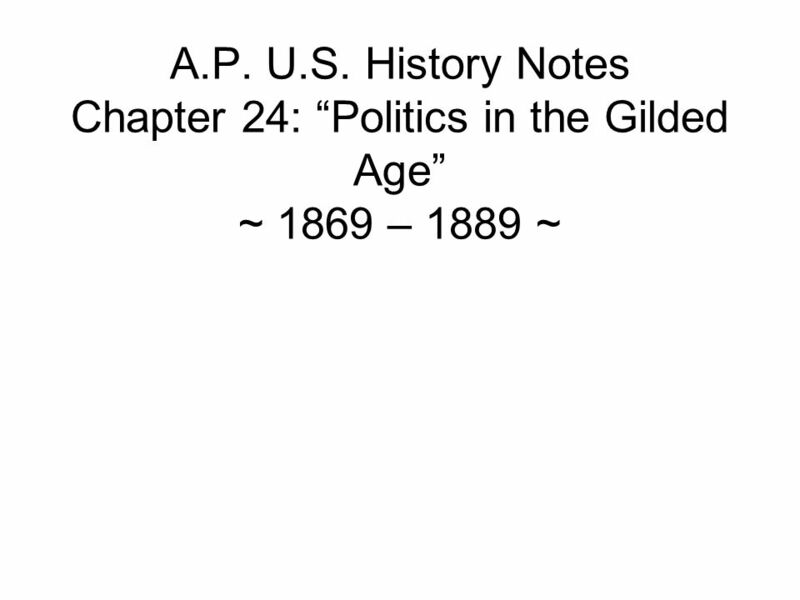 CHAPTER 23 THE GILDED AGE. Gilded Age Politics Hayes to Cleveland Issues and Debates Alliance and Peoples Party. A New Spirit of Reform Chapter 21. The Gilded Age Mark Twain gives this time period a great nickname! Mark Twain The rich get richer The poor get poorer. Click the mouse button to display the information. In what scandal did Fisk and Gould participate? Manipulating the price of gold defrauding the government on railroad expenses diverting funds from New. The Collapse of Reconstruction Lesson 20: Reconstruction and it’s Effects part 5. 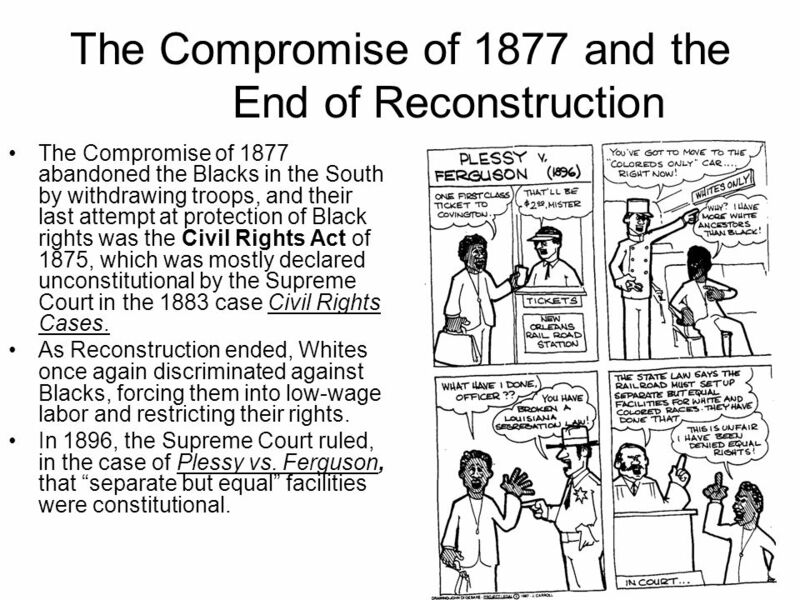 WHY DID THE US GOV’T CEASE RECONSTRUCTION PROCEDURES IN THE SOUTH? WHY IS GRANT CONSIDERED ONE OF THE WORST US PRESIDENTS IN US HISTORY? 4.8 Grant and. POLITICAL PARALYSIS IN THE GILDED AGE Chapter 23 Emily, John, Sam, Garrett Mark Twain wrote, The Gilded Age: A Tale of Today in 1873. Political Paralysis in the Gilded Age Mark Twain termed the period between the death of Abraham Lincoln to the accession of TR as “The Gilded Age” a time. Political Paralysis in the Gilded Age Chapter 23. Baltimore Polytechnic Institute January 28, 2014 A/A.P. U.S. History Mr. Green. “I know now that all that glitters is not gold... However, I still go underrating men of gold, and glorifying men of mica. Commonplace human nature cannot.